This is one of my favourite mornings in Israel. Well not the part where the alarm goes off at 4:30 a.m., no, that really does not rock my world. But the reason for the early start is awesome. The truth be told…again and again, I was not part of the wake-up crew but it was reported to me that the kids were lights out fantastic when the lights came on. 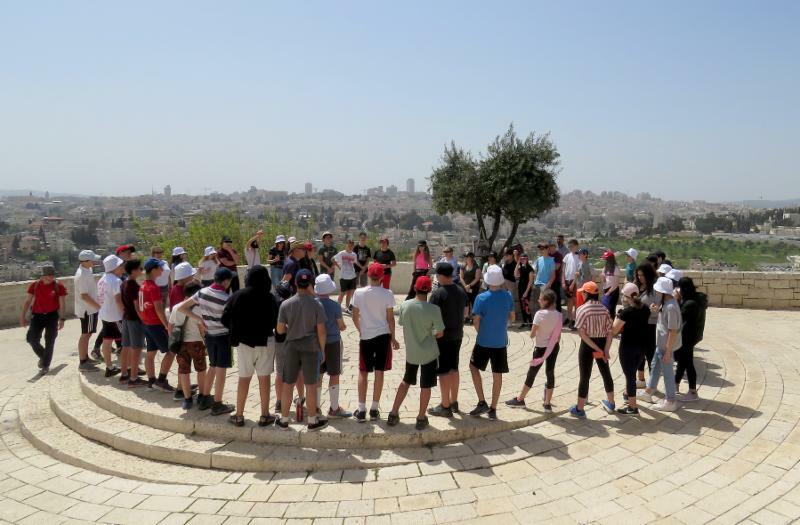 Our guide, Barak, said we were the best organized and awake young group he has ever experienced (he then compared us to Israeli students and it almost delayed our trip as he laughed…). We left the Bedouin Tent early and drove the 20 minutes to our walking start at Masada. We started our ascent from the former Roman encampments, which shortens the trek considerably from the main gate to about 20 minutes – much of it pretty straight up. After organizing everyone, making sure we had hats, water, and closed-toe shoes, we were off – it was easily the warmest 6 a.m. desert morning we have experienced – most of us dressed in shorts and foregoing sweatshirts. I cannot count how many times I have done this but it does not get boring – the outline of Masada in the morning light prior to the sunrise – I always see it, as the cliffs jut out like a charcoal outline against the cool blue-black night sky. We waited about 30 minutes for the spectacular sunrise as the sky lightened, and then suddenly the top of the sun appeared over the mountains. It was greeted with kids taking photo after photo – selfie after selfie. It really is magical – and the sun comes up so quickly it is so easy to watch the entire sunrise without missing a moment. Spectacular – it best be on your bucket list or you have the wrong list! After this Barak walked us around – explained some of the history of Masada and showed us how food and water were obtained (pigeon anyone?). He also showed us this great spot where the students all yelled the same word, "Freedom", and the mountains yelled back (commonly known as an ‘echo’ but his story was better). The students then hiked down into the big cistern where water was stored – and there they listened more and then celebrated – we have three birthdays on this trip (not counting yours truly who is just grateful it is not over Pesach this year). Adam’s birthday was over Shabbat a few days back, Mhairi’s birthday is today and Aden’s is tomorrow (more fun to come) – so they sang, tossed them up in the air (mostly caught them) and we gave them chocolate – well we did that in Jerusalem at the hotel but it fits so beautifully in this paragraph. Soon, after our second bathroom break we headed down the Snake Path – after almost two hours on Masada. This winding trail takes 40 – 60 minutes to hike down and is very steep in parts, and slippery as well. It is a real knee-killer, and my young colleagues should forbid me from me walking down – needless to say I stayed at the back of the line! Did I mention that although it was 8ish a.m. in the morning that it was already hot? At the base of Masada, there are a couple of buildings and we had breakfast in the lower one just to make sure I got a few extra steps in! It is pretty standard cafeteria buffet fair and everyone seemed pretty happy except me – one coffee machine was broken and the other one was working slowwwwwwllllllyyyyyy. Once everyone was satiated we headed back to the busses for a brief drive to our next stop – the Ein Gedi Dead Sea Spa. At the Spa, students were given lockers and towels and most headed down to the Dead Sea – which is reached by a tram, as the sea has receded so far from its original location. I passed on this adventure (been there, done that and I was pretty tired – getting old you know) but Miss Lane, Mr. Dichter and Lu went down for the action. They told me it was brilliant and for Miss Lane, as her first visit, she was smiling in the bus all the way to Jerusalem (well, truth be told, she is always smiling!). After a couple hours of playing in the hot sun it was lunch time. The buffet lunch was surprisingly good this year – chicken kebabs, schnitzel and lots of veggies (and the jello for dessert seemed a big hit). After lunch, and one final visit to the sherutim (washrooms), we were on the road to Jerusalem. The drive north was about two hours but it passed by in a flash – everyone was exhausted from the dawn trek. Our first stop in Yerushalyim is always at Mount Scopus, where the view is magnificent, and we took a breath to appreciate the moment. We stood in a circle, said a Kiddush over grape juice and then added the Shehecheyanu as we experienced this new and special moment together. Barak had us say both prayers one word at a time and recite extremely loudly in repetition as if we wanted the whole city to hear our arrival (I think many did!). Next stop was the Machane Yehuda market where we allowed the students to roam in groups of four or five within specific boundaries – I sat (and drank) with our medic at Aroma so everyone knew where I was (I always draw the most strenuous duty on the team) – it was our starting and final gathering place (they should have paid us a cut on all the ice coffees or mochas they sold our students). It was a fun and crowded visit as the Israeli election today gives everyone a day off work so the market was hopping. I thought there might be more election noise but aside from the odd person yelling "Bibi" (and as Dorin points out they might just be talking but it sounds like yelling to our gentle Canadian ears) you would have simply thought it was Shabbat busy. Finally – and I do say finally, just around 4:30 p.m. – some twelve hours after we all woke up, we arrived at our hotel, the Jerusalem Gardens. By the time we had everyone checked in (small lobby, slow, teenie elevators – can you say "balagan"?) and I had thoroughly upset every student by trying to get them to listen to get up the three elevators (they are so small I would say it took about 15 elevator rides. We gave our exhausted bunch of students a couple of hours to "chill out" and go to the pool or clean up (I chose the latter). The day ended with a dinner at 7.p.m. followed by a ‘Fruit Party’ at 8 p.m. Students and chaperones bought different fruits while at the market and brought them to our party room to taste. As a group we shared again some moments that we loved in the last 48 hours, and wrote notes to leave at the Kotel tomorrow. I missed out on most of the fruit joy as I visited with alumni who are in Israel (Nicole Grubner, Liam Sasky and Ben Mizrachi) – it was so great of them to take the time to come and see us! Tomorrow is a 6:30 a.m. rise – basically sleeping in after today – where we have the honour of taking many students for their first visit ever to the Kotel – again, it does not get better than that!